The Orange Tabby is seemingly found everywhere. They randomly pop up in litters like a surprise visit from Santa. Like a goose among a bevy of swans, orange tabbies forever stand out. When digging into the mystery of Tabby Cats, the first necessary mention is that they are not a cat breed! We often proclaim that, “He/She is a Tabby Cat.” But really what we are doing is simply describing the cat’s color pattern. We follow along with the rest of society, unknowingly asserting this misconception when somewhere in the depths of our mind we know it’s a simple matter of color coordination. You can see the tabby pattern in a gray color as well, along with brown and creme. What’s even more notable is that the signature stripes of the tabby pattern, isn’t the only kind! Those signature stripes are called Mackerel. Which gives your feline a “tiger” look. This pattern is comprised of long, narrow stripes across the cat’s body. The Classic Tabby pattern is seen in swirls along the cat’s body. Which can also sometimes look similar to a bullseye and can be described as having a “marbled” or “blotched” look. The Spotted Tabby pattern, you guessed it- has spots! You’ll be able to see these round or oval spots even on the cat’s underbelly. The Ticked or Agouti pattern is easily seen in the Abyssinian breed. This pattern is slightly less obvious than bold stripes and spots. The actual hair changes color the further down you go. The hair is lightest at the root and gradually become darker nearing the end. With all of these colors and variations, how are the Tabby not its own breed? All tabbies are said to have an “M” on their forehead, that counts as a breed standard, right? There has to be some point in history where these cats were known for more than being just a group of patterns. And how is it that Tabby Cats have never lived down their reputation for being alley prowlers, eating out of discarded tuna cans and scrapping out their own place in the world like Al Capone? A scientific study released in 2017 found that 80% of all present-day cat breeds carry the genetic tabby mutation. The study also found that this split in genetics happened during the reign of the Ottoman Empire. By the 18th century, these coat patterns were found everywhere and were one of the most common color coordinations found on felines. The specific gene responsible for this genetic mutation is called Taqpep. This gene is not only found in domestic cats but in wild cats as well! Put simply, these patterns and color variations have been passed down for thousands of years and were once incredibly useful camouflage in the wild. There are many tales as to how these tabbies got their “M.” Although super fun to debate about, it’s origin is as simple as genetics. 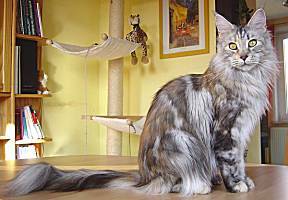 Similar to having black hair that can be found in many races of various people (Asian, Caucasian, African, and too many more), the tabby’s “M” and their patterns can be found in many cat breeds. As for the Tabby reputation, we can’t help but view them the way we do. If you think back to some of the most popular cartoons like Garfield, Bonkers, Puss ‘N Boots from Shrek, and even The Cheshire Cat; They’re all tabbies! They’re majority orange tabbies being rambunctious and mischievous. What also doesn’t help their reputation is that orange tabbies have been reported to be the second most common cat found in a shelter. Even though tabby’s are not one singular breed, they can be found in ALL breeds, even wild ones. Which kind of makes up for not having their own page in the breeder’s book, right?